You can have your written work read by language tutors before you turn your final draft? Stop by the Multilingual Writing Center (located in the basement of the Library next to the archives) to make an appointment. Bring a hard copy of your written work with you to your appointment and receive feedback from advanced speakers. 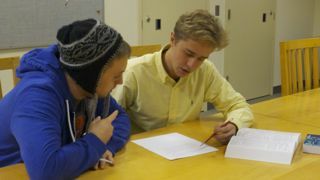 Language Tutor Vadim Ivanishchev, from Moscow, Russia, reviews a student composition.